In the long-running campaign to promote acceptance of nonbelief, billboards are just the latest propaganda battlefield. 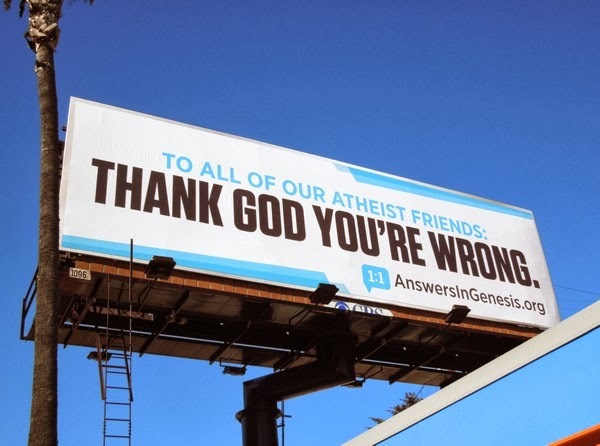 Atheists nationwide, like the Centers for Inquiry (CFI) and the Freedom From Religion Foundation, are putting up billboards that urge closeted nonbelievers to declare their lack of faith. Once in a while, a church will respond with chiding board of their own, often with not well-reasoned, respectful arguments. Is this form of advertising obsolete? Are billboards too old-fashioned to appeal to millennials, the fastest-growing group of nonbelievers? Are we simply too buried in our smartphones to even look up anymore? No, we&apos;re actually not. The billboard&apos;s simplicity makes it an enduring weapon in the endless search for better advertising. Visible just long enough to catch the attention of drivers, pedestrians, or other passersby, the success of billboard messaging depends on its succinctness. Much like a meme, the idea is to quickly communicate something the person can easily ponder long after seeing it. And much like a tweet, the billboard&apos;s limited space forces the creator to choose its words extremely carefully, thus sharpening the message. Even though billboards predate the age of digital information, their terseness sustains their existence. Atheist adverts benefit also from their fusion of relatable traditions and critical thinking. By appropriating an old medium for a new cause, the advertisements combine familiarity with a new secular perspective. Instead of advocating for consumerism, the billboards promote social equality. By embracing the seasonal spirit, the CFI is using the holiday season conceptualize holidays in a new light. Instead of ignoring Christmas or slandering it because of its superstitious origins, they&apos;re using it as an opportunity to connect atheists with other nonbelievers. The message of billboards is important to their success. By noting the pagan and naturalist origins of Christmas and other ostensibly "Christian" holidays, CFI is simultaneously challenging historical myths and asserting that nonbelievers are equally capable of enjoying the holiday season. Telling a story in a nuanced way allows anyone with a basic knowledge of the Christmas tale to approach a discussion of religious belief. This is exactly what the CFI wants — an atheist glasnost: openness for nonbelievers, and tolerance of their disbelief. By demonstrating that Thanksgiving and Christmas can be enjoyed by the faithless, atheists are suddenly just a little more like everybody else.